Sometimes hearing aids just aren't enough. One in five Americans has hearing loss. At 20% of the population, this makes them the largest disability group in the country. While personal hearing aids help almost anyone with hearing impairment, they may not be enough in difficult listening situations, such as poor acoustics, disruptive background noise, and lengthy distance from the sound source. These situations present challenges to those individuals with hearing aids, as well as people with lesser degrees of hearing loss. Assistive Listening Systems change that. Assistive listening systems are the sound equivalent of a wheelchair ramp. They give the hard of hearing the opportunity to participate in situations they may otherwise avoid due to feeling unable to fully participate. Traditionally, government buildings and larger facilities, such as educational facilities, houses of worship, courthouses, museums, and stadiums, have offered some form of assistive listening. 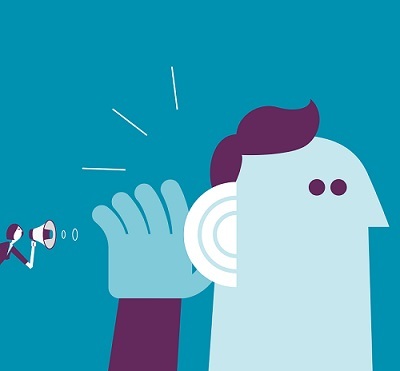 However, corporations and other organizations are discovering that assistive listening can greatly enhance the experience of their employees and guests in conference rooms, auditoriums, boardrooms, and other group meeting spaces. Providing ALS not only helps people feel connected to their communities, participate in meetings, and attend events, it is actually required by law. The Americans with Disabilities Act of 2010 was a giant step in the right direction, recognizing the needs of the hearing impaired. The Act states, “In each assembly area, where audible communication is integral to the use of the space, an ALS shall be provided”. As of March 2012, any new construction or renovated space must follow these guidelines. Civil penalties for non-compliance are steep — as much as $150,000 per infraction. Listen Technologies is an innovating, industry-leading assistive listening provider since 1998, and has recognized UnifiedCommunications.com as a Premium Listen Technologies Partner since 2005. As such, we are experts in the assistive listening sphere and greatly enjoy educating the public about these important systems and becoming ADA compliant. 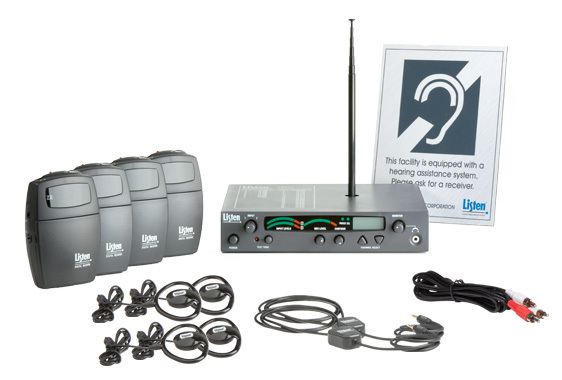 There are several different assistive listening technologies available: induction loop, radio broadcast, and the latest that we are particularly excited about, infrared. Each has its advantages and drawbacks, and choosing the right one depends on the needs of the venue. All systems utilize a microphone, a transmitter, and receiving devices. The transmitter picks up sound that is sent to a personal receiver that then relays the sound in real time to the listener through their hearing aid or, for example, ear phones. Systems can be stationary, portable, or both. Larger venues, like stadiums and auditoriums, usually opt for stationary systems, while portable systems provide flexibility for corporate environments and group tours.Why should we federate? If you have found connecting with people inside your organization through UC platforms to be beneficial, extending this connection to external federated users—such as customers and suppliers— is even more powerful. Connecting with external users as easily as you would internal users breaks down barriers between organizations and allows you to get straight down to business. The potential for increased communication and collaboration is enormous. These systems use a wire that is installed around the perimeter of an area, usually the ceiling or under carpeting. A microphone feeds sound to an amplifier, which is then fed into the wire and generates an electromagnetic field. While within this loop, the listener can turn on the telecoil setting on their hearing aid and pick up the sound directly into their ear. For those without a telecoil hearing aid, sound is transmitted to a receiver worn on the body and then into their ears via headphones, neck loop, or connection to a non-telecoil hearing aid. Induction loop is the only ALS that allows listeners with telecoil hearing aids to automatically pick up sound without using a receiving device. It is also the most expensive due to the more intrusive installation process. Interference from other electronic devices is also a possibility, and listeners must be within range to hear the sound. Radio broadcast systems are much simpler in terms of installation. Radio waves are used to transmit the sound from the source to a personal receiver. A transmitter can be attached to a microphone and worn on the body of the speaker or wired into the venue’s sound system. 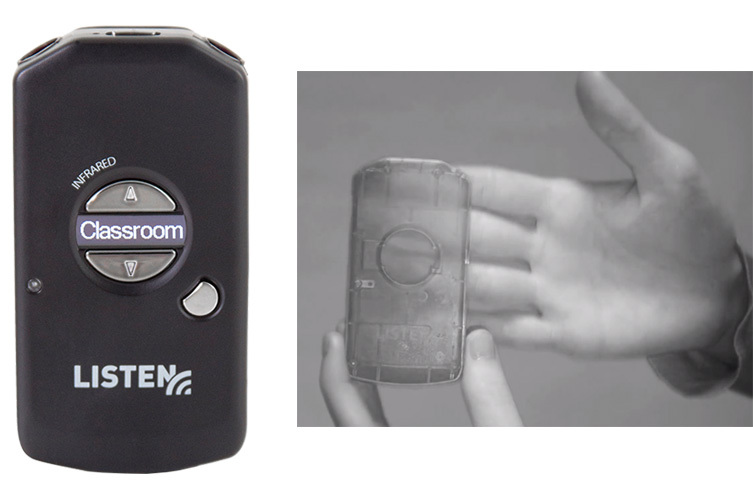 The receiver can be connected to a listener’s hearing aid or to ear speakers or headphones via neck loop or attached elsewhere on the body, like a belt loop. Radio allows for the utilization of multiple audio channels, unlike induction loop. Multiple channels allow the patron to hear multiple speakers or sound sources at the same time, such as two lawyers in a courtroom or both the pastor and the choir in houses of worship. These channels can also be used for things like audio description, instruction, and language interpretation. Since radio waves permeate walls, a clear advantage of these systems is that listeners can hear the channel’s broadcast at a greater distance from the sound source, from behind walls and pillars, or from nearby rooms. These systems are usually the least expensive of the three. Their drawback is that the listener must have their receiver tuned to the exact channel they wish to listen to, otherwise they will hear a different sound source or nothing at all. Sound interference is also possible, meaning a person could, for example, pick up sound from a listener’s receiving device if they are using an FM system on the same channel, or the listener may even pick up a transmission from two-way radios within the vicinity. 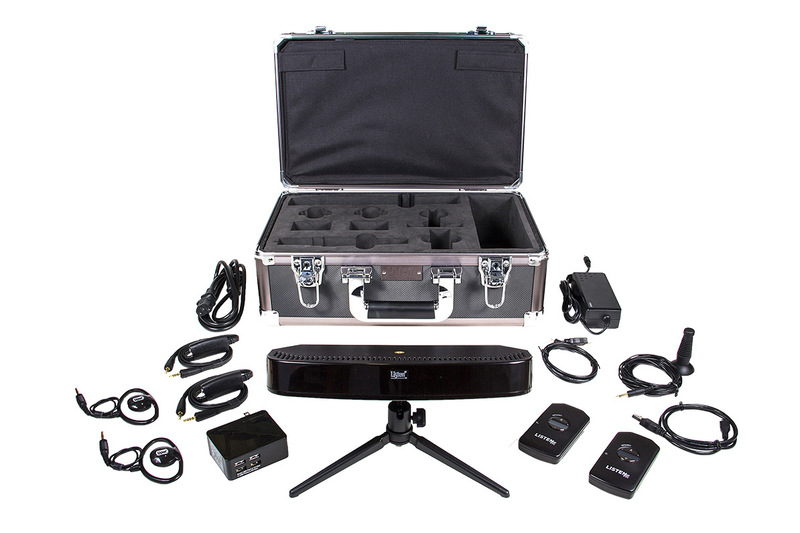 Infrared is the newest of the assistive listening technologies. Operating similarly to radio systems, IR systems use invisible light waves to transmit sound to receivers. The difference between IR and radio sound transmission is line-of-sight. Much like your TV remote, infrared light needs a direct line-of-sight from transmitter to receiver or else the connection is not made. However, this inherent disadvantage not shared by induction loop and radio systems is an advantage of infrared in another capacity: security. IR systems are inherently secure and private because light waves, unlike radio waves, do not pass through solid objects, even glass. Therefore, infrared is the obvious choice in confidential settings like boardrooms or courtrooms, as the transmission does not extend through the walls and is inaccessible to those outside the room. Infrared provides a broader area of coverage than radio and reduces sound interference. An IR radiator, like the headlight of a car, is used to flood IR light into an area, drastically minimizing gaps in coverage. Building materials, fluorescent lighting, and other equipment do not interfere with the signal. This results in clear, consistent and reliable sound quality. Like radio, IR supports multiple channels but without the interference problems inherent to radio. Listen Technologies has recently developed a new infrared product suite, featuring an exciting IR receiver made out of transparent IR material that enhances the line-of-sight coverage area. The system can also be portable, which is perfect for corporate environments. The receiver runs on a lithium-ion battery, greatly reducing the cost of changing alkaline batteries and reducing the number of batteries sent to landfills. IR systems are usually a little more expensive than radio ALS, although not as much as induction loop. With twice the power of other IR products and a coverage area of up to 30,000 square feet per transmitter, clear and focused audio will transmit directly to the intended audience – and no one else. That's great, but where to start? Don’t worry — the minimum ADA requirements for assistive listening systems are generous and entirely dependent upon the capacity of the venue or room, so ALS need not be daunting investments. The systems discussed come in various customizable packages, allowing organizations to accommodate their ADA-specified minimum requirements without being a budget buster. As a Premium Listen Technologies Partner, UnifiedCommunications.com maintains our Premium status by consistently providing a superior pre-need consultative approach and dedicated post-sales support to each of our customers. If you are in need of an assistive listening system in compliance with the ADA, or would like to learn more about ALS options, call us to discuss your needs. Together we can help everyone hear everything.